Th e M Rep o RT | 57 O r i g i nat i O n s e r v i c i n g a na ly t i c s s e c O n da r y m a r k e t SECONDARY MARKET the latest Private-label securitization market disappearance affects credit access Consumers without stellar credit and those in need of jumbo loans may find it difficult to obtain mortgages in a government-dominated market. a diminishing private- label securitizations market among strong government-backed loans presents credit implica- tions for the mortgage market. 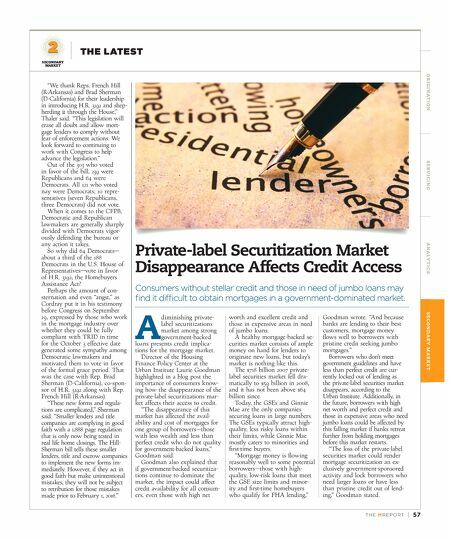 Director of the Housing Finance Policy Center at the Urban Institute Laurie Goodman highlighted in a blog post the importance of consumers know- ing how the disappearance of the private-label securitizations mar- ket affects their access to credit. "The disappearance of this market has affected the avail- ability and cost of mortgages for one group of borrowers—those with less wealth and less than perfect credit who do not quality for government-backed loans," Goodman said. Goodman also explained that if government-backed securitiza- tions continue to dominate the market, the impact could affect credit availability for all consum- ers, even those with high net worth and excellent credit and those in expensive areas in need of jumbo loans. A healthy mortgage-backed se- curities market consists of ample money on hand for lenders to originate new loans, but today's market is nothing like this. The $718 billion 2007 private- label securities market fell dra- matically to $59 billion in 2008, and it has not been above $64 billion since. Today, the GSEs and Ginnie Mae are the only companies securing loans in large numbers. The GSEs typically attract high- quality, less risky loans within their limits, while Ginnie Mae mostly caters to minorities and first-time buyers. "Mortgage money is flowing reasonably well to some potential borrowers—those with high- quality, low-risk loans that meet the GSE size limits and minor- ity and first-time homebuyers who qualify for FHA lending," Goodman wrote. "And because banks are lending to their best customers, mortgage money flows well to borrowers with pristine credit seeking jumbo mortgages." Borrowers who don't meet government guidelines and have less than perfect credit are cur- rently locked out of lending as the private-label securities market disappears, according to the Urban Institute. Additionally, in the future, borrowers with high net worth and perfect credit and those in expensive areas who need jumbo loans could be affected by this falling market if banks retreat further from holding mortgages before this market restarts. "The loss of the private-label securities market could render mortgage securitization an ex- clusively government-sponsored activity and lock borrowers who need larger loans or have less than pristine credit out of lend- ing," Goodman stated. "We thank Reps. French Hill (R-Arkansas) and Brad Sherman (D-California) for their leadership in introducing H.R. 3192 and shep- herding it through the House," Thaler said. "This legislation will erase all doubt and allow mort- gage lenders to comply without fear of enforcement actions. 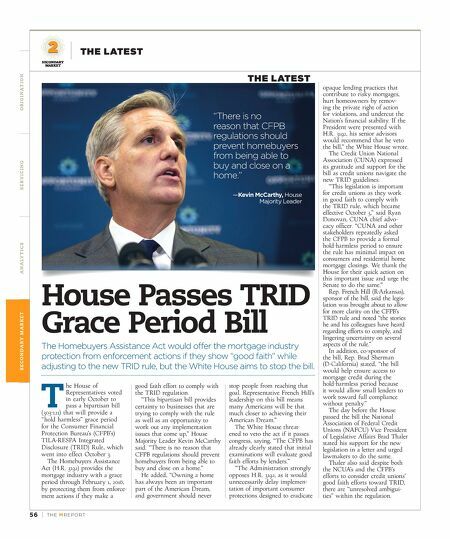 We look forward to continuing to work with Congress to help advance the legislation." Out of the 303 who voted in favor of the bill, 239 were Republicans and 64 were Democrats. All 121 who voted nay were Democrats; 10 repre- sentatives (seven Republicans, three Democrats) did not vote. When it comes to the CFPB, Democratic and Republican lawmakers are generally sharply divided with Democrats vigor- ously defending the bureau or any action it takes. So why did 64 Democrats— about a third of the 188 Democrats in the U.S. House of Representatives—vote in favor of H.R. 3192, the Homebuyers Assistance Act? Perhaps the amount of con- sternation and even "angst," as Cordray put it in his testimony before Congress on September 29, expressed by those who work in the mortgage industry over whether they could be fully compliant with TRID in time for the October 3 effective date generated some sympathy among Democratic lawmakers and motivated them to vote in favor of the formal grace period. That was the case with Rep. Brad Sherman (D-California), co-spon- sor of H.R. 3192 along with Rep. French Hill (R-Arkansas). "These new forms and regula- tions are complicated," Sherman said. "Smaller lenders and title companies are complying in good faith with a 1,888 page regulation that is only now being tested in real life home closings. The Hill- Sherman bill tells these smaller lenders, title and escrow companies to implement the new forms im- mediately. However, if they act in good faith but make unintentional mistakes, they will not be subject to retribution for those mistakes made prior to February 1, 2016."